ABM NeuroMovement® Graduates are encouraged to take advantage of the continuing education programs available, allowing them to learn new specialty areas like Vitality and Anti-Aging. Gain additional knowledge, skills, and tools to help transform the lives of adults, the aging, and those who have suffered trauma, injuries, and illness by reversing the process of aging in the brain to overcome limitations, often beyond what was believed to be possible. NeuroMovement® has helped older adults and those who have suffered traumatic brain injuries and strokes to regain function, eliminate pain, and dramatically improve their physical, cognitive, and emotional performance. 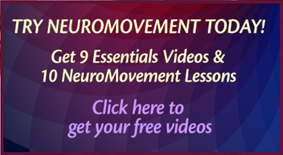 The ABM Continuing Education Mastery Workshop – NeuroMovement®: Vitality and Anti-Aging – Levels 1 and 2 will take place online. There are two training levels, for a total of 18 days Online (OL) and a 5-day In-Person (IP) workshop; plus several one-hour conference calls during the OL workshops. The workshops are managed by a highly skilled and dedicated teaching staff. The time between each CE Workshop is approximately four weeks. For each online workshop, there will be several 1-hour conference calls with Anat Baniel and/or other trainers. Conference calls will be recorded for later listening/viewing. Group leaders (ABM training staff) and/or Anat will be available for questions and support during conference calls. 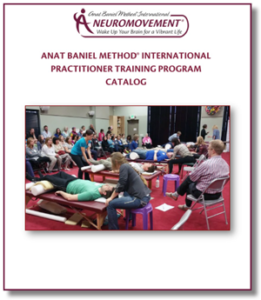 Dedicated and exceptional support staff—all ABM NeuroMovement® Practitioners who have completed the 2 CE Mastery Workshops—will be at the 5-day in-person workshop. Upon completion of the 2 levels of the CE Mastery Workshops for Vitality and Anti-Aging, practitioners will be certified as specializing in ABM NeuroMovement®: Vitality and Anti-Aging. The total training duration is approximately three months. **Recordings of the in-person workshop will not be available; the 5-day workshop is only available in person. Before a Practitioner may enroll in Level 1 – Vitality & Anti-Aging CE Mastery Workshop, s/he is required to have successfully completed all CE Mastery Workshops for Working with Children with Special Needs. Before a Practitioner may enroll in Level 2 – Vitality & Anti-Aging CE Mastery Workshop, s/he is required to have successfully completed Level 1 – Vitality & Anti-Aging CE Mastery Workshop. Before a Practitioner may enroll in the bonus optional 5-day in-person workshop, s/he is required to have successfully completed Level 2 – Vitality & Anti-Aging CE Mastery Workshop. Help adults move beyond pain and limitation!